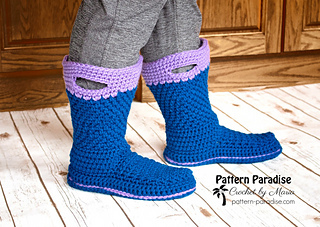 These cozy, warm slippers are perfect for men and women. They are styled after those fun rubber rain boots we all had when we were children, you know, the ones with the handles on the sides so you could put them on easily. 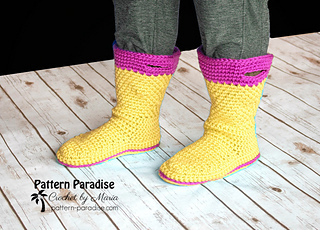 They were available in bright yellow and other fun colors too, so have fun with your color combinations for these slippers! 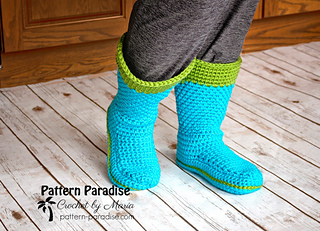 They are made with bulky yarn, they sport a double sole and close fitting foot and ankle for comfort and maximum fit. I sized them for men and women and therefore the sizing is based on foot length. 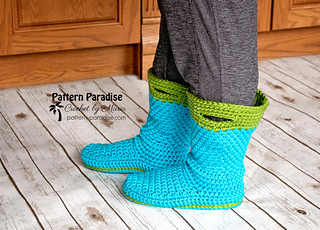 These have become my favorite slippers! 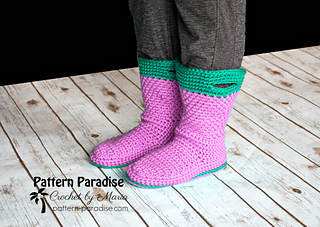 This is part of the Slipper Of The Month Series!